Made with rubber belting over strong wire rope. 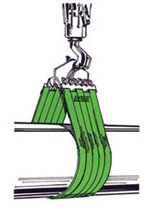 Self-releasing – belt automatically unhooks after pipe is landed. All components are made from top-grade material including alloy steel end irons and abrasion resistant nylon, coated for better wear resistance. Liftex also offers Lined Steel Choker Belt, steel-lined fabric-faced belts that holds the pipe firmly in place with no slippage. adapts to all types, sizes and load configurations. Made from extreme load bearing, high tenacity polyester yarns.